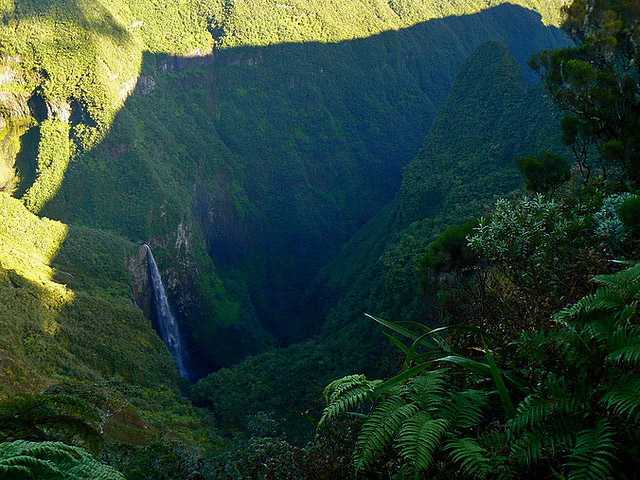 Trou de Fer is one of most magnificent canyons in the world. 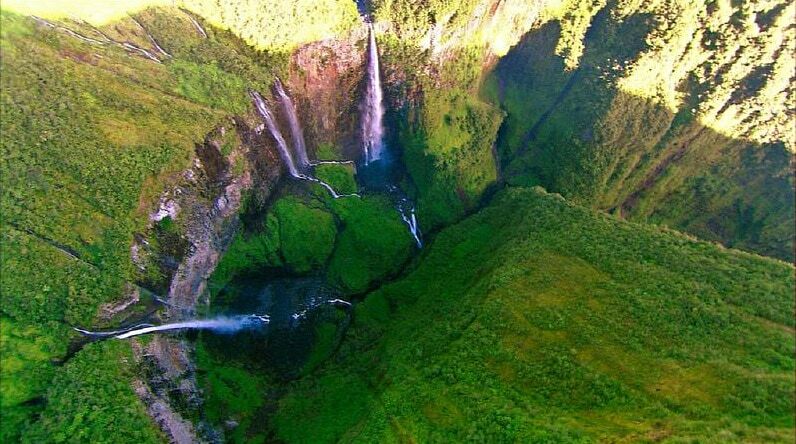 This canyon is adorned with countless waterfalls, including the 725 m tall falls of Bras de Caverne stream. It is hard to describe and photograph this amazing, seemingly improbable place. Trou de Fer could be translated as "Iron Hole" but this most likely is not the original name of canyon, initially it most likely was Trou d’Enfer – "Hell Hole". This giant and complex ravine has formed in the comparatively soft volcanic rock, formed by Piton des Neiges – the tallest volcano in Indian ocean. Canyon starts at the height of some 1,400 m in the exotic Bélouve forest – unique montane forest with numerous endemic species and ends after some 7.5 km, when Bras de Caverne river joins Rivière du Mât some 240 m above the sea level. Canyon starts with the falls of the small Bras Mazerine stream (which often is dry). This stream with several falls disappears into very deep cirque, small pool named Bassin Fenoir. Several smaller trickles join from other sides of cirque. Some springs appear from the porous volcanic rock in this cirque. The larger and better known waterfall of Bras de Caverne river joins the canyon from the left side after some 1.4 – 1.8 km. Waterfall of Bras de Caverne (River of the Cave) has three major steps. First is 210 m tall, it often is dry. After some 550 m comes the next major step – approximately 180 m tall. 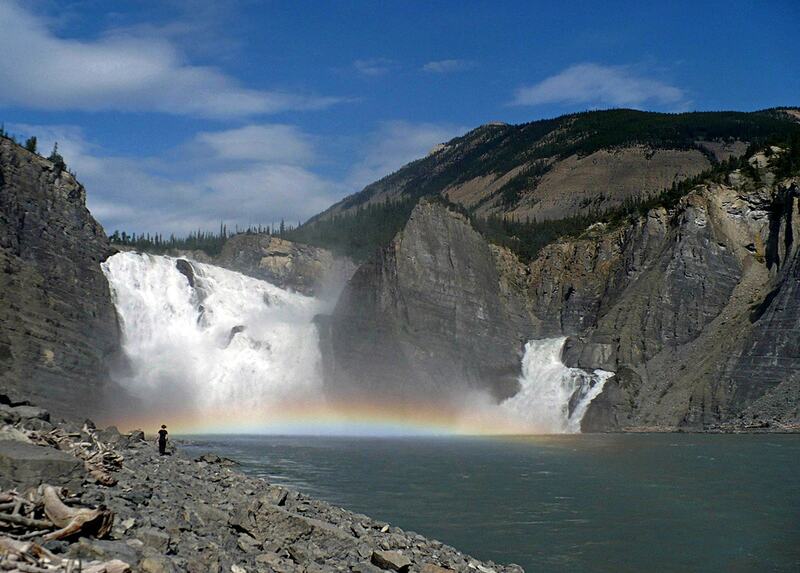 Some 300 m further comes the tallest – 300 m tall fall. This is magnificent, free leap deep into narrow chasm, in a pool named Bassin des Grands Vents. Only closer to the bottom part water hits the cliffs. In this part of Trou de Fer meet some six waterfalls – also Bras Mazerine makes here some 270 m tall fall. This narrow cirque is filled with almost unbearable noise – the diverse pitch and rhytm of falls creates deafening resonance. Now all waterfalls and springs have formed sizeable stream (which after the frequent rains becomes REALLY large) and it disappears into incredible slot canyon through "Washing Machine" – a place where the fierce stream turns some 90 degrees, rising eternal mist. Now starts dramatic landscape of another character. Bras de Caverne stream here flows through incredibly deep slot canyon – the 3.2 km long "Corridor". Stream here is just a few metres wide but the walls of canyon rise up to 850 m tall. Walls are covered with tropical plants but nevertheless rather frequent are rockfalls. After the frequent rains the bottom of canyon turns into violent stream where no one can survive. Rockfalls form small, eerie lakes, including the the Lake of Eels – a truly otherworldy place. This canyon was first climbed/walked by Pascale Lapoule, Laurent Broisin and Pascal Colas on September 19-21, 1989. Now in the beautiful Bélouve forest have been built nature trails which provide fine views on canyon (but it is not possible to see the bottom). Very often here come helicopters – tourists gladly pay large sums to see Trou de Fer from above. Few dare to climb the canyon. Unfortunately rather many calamities have happened here – volcanic rock is slippery and crumbling, flash floods – sudden and merciless. Nevertheless the climbing route is gradually improving, opening a possibility to experience this amazing place. Pascal Colas, Consultant, Trainer, Mountain Guide. Reunion canyons. 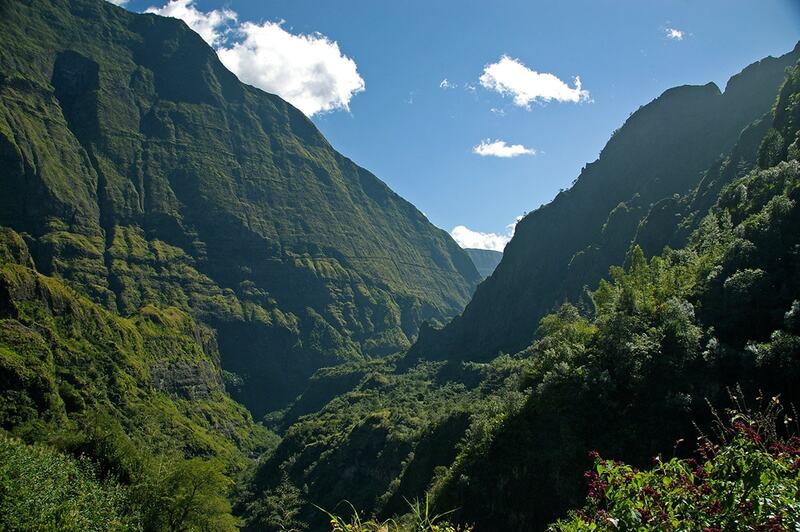 In spite of its small size Réunion offers rather diverse landmarks. 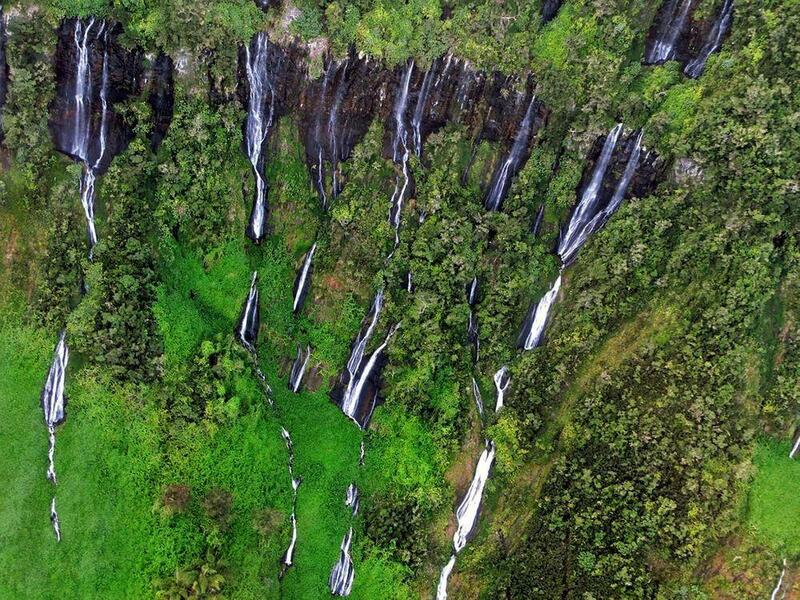 Most impressive landmarks in Réunion are the numerous supertall waterfalls in forest covered, incredibly deep canyons and ravines. Uninhabited by humans, the Mascarene Islands of the Indian Ocean were once home to an extraordinary range of birds and reptiles: giant tortoises, parrots, skinks, geckos, burrowing boas, flightless rails and herons, and, most famously, dodos. But the discovery of the three isolated islands in the 1500s, and their colonization in the 1600s, led to dramatic ecological changes. The 750,000 inhabitants of Reunion Island – located east of Madagascar – make up a plural and complex society: a mosaic, artificially composed, created ex nihilo by French colonial rulers under the impulse of European market capitalism. The absence of any deep-rooted indigenous cultural identity prior to plantation slavery and colonization, constitutes a fundamental dimension of the quest for identity within Reunionese society.